Over the last few weeks, Grade 4 has been investigating water. We have discovered that fresh water is a precious resource. We also learned that it is often polluted. Agriculture, sewage, industry and detergents can make water unsafe to drink. Many people around the world do not have clean water. In China, over 100 million people are drinking unsafe water every day. This causes diseases. Today, special guests from RISE Tsinghua University visited to teach us how to keep water safe and make it clean. They have invented a special filter called a bio-sand filter. It uses sand to trap the germs in water. 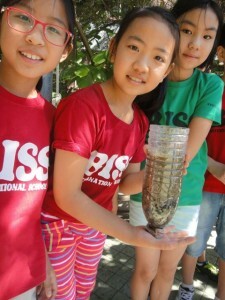 They travel around China, teaching communities how to protect their water and make it cleaner. After watching their presentation, we went outside to make our own filters! We were in 4 teams for “The Cleanest Water Competition”. We prepared bottles, stones, sand and dirty water. In this order, we added water, large stones, smaller stones and then sand to the bottles. At last, each group’s filter was ready! We took turns to pour dirty water into our filters. Then we looked at the water coming out and it was very clean! The University student chose the winner by judging which team had the clearest colour. Benedict, Joshua, Jack and Geon Woo’s team were the winners! We had a great lesson with RISE Tsinghua University students. We learned a lot about water pollution and ways to clean water. We think their work is very important in China. Why is water so precious as a resource? How can you conserve water in your own life? How can you conserve other finite resources in your life? It was great idea to investigate about water. I knew that only 0.3% of the Earth’s water is ok to drink. Now I think I need to conserve water. I’ll conserve the water by using the left over water in the tub to flush the toilet. I think other finite resource are also important so I will turn off the light when nobody is in the room so we can save coal (because coal makes the electricity). The most fun part was making the filter. It was a great day. I liked the presentation that the special guests from RISE Tsinghua University showed us. I wonder how did they figure how they can get clean water from the filter? I think water is very precious because water can get dirty and we are polluting it so fast. We can conserve water by turning off the tap when you are brushing your teeth. You can also save water by washing your fruits and vegetables in a pan of water instead of running water from the tap. I really liked it when we created our filter. It was very fun cleaning water. I think we can conserve water by not taking long showers, not leaving the taps on too long and only using it when you really need it. I think that will save a little bit of the world. I learned that if you put your toilet near underground water, the water will get dirty. But if you build the toilet below the underground water it will be impossible for the water to rise up. This is important in countryside communities. Thank you for getting us a chance to learn how to make the water cleaner with a very simple filter. Water is very precious as a resource because the water we can drink is a very small part of the worlds’s water so we have to save the water. We can conserve water by reusing and reducing the finite resources and water. And the RISE TSINGHUA University told us how to make a filter. We made the filter with the old bottles cut of the end and put dirty water, small rocks, big rocks and sand in it. We first put water inside the water bottle, then we put the small rocks than we put the big rocks in than we put in A LOT of sand. We had a competition after the making. 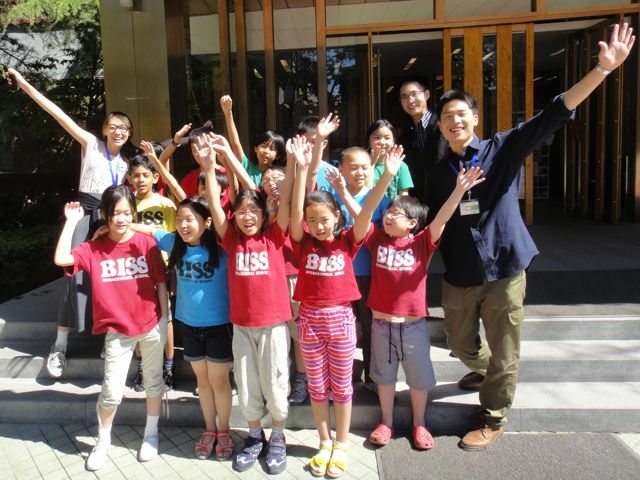 We had fun with the RISE Tsinghua University! We really enjoyed this activity. I learned many things that I didn’t know before. For example, I learned that toilet needs to be uphill from the well because the dirty germs might go inside the well’s water and make people sick. I also enjoyed making a water cleaner. My team won 2nd place at the cleaning water competition! Thank you Tsinghua University students for teaching us about water! I loved the feeling of the materials. My favorite part was making the filter because I could make a filter that really cleaned the water, and I was so exited. When it is our turn I thought that the water will be so clean that you can drink it. (But I couldn’t drink it.) The competition was also fun. In the competition we lost but I had lot of fun. I learned about how to keep the water clean such as, do not poop or pee beside the river, do not throw rubish beside the river and do not pour waste water beside the river. This is a very good with this kind of water filter, but people in some places do not know how to use this method. Cleaning water is awesome! I had never tried to clean water and I never tried to make a filter. 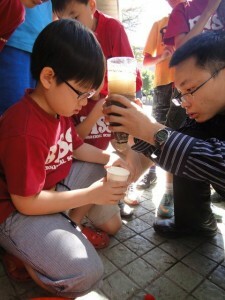 It is very fun but we also learn many things about water such us water is precious because we can’t live without water. We also need to conserve water because water changes to be dirty (with pollution) so we should conserve water. We can conserve water by not putting trash beside the water, and not putting soap in the water. We also can conserve another things such us trees by not using as many papers. I think we should conserve finite resources! I think water is the most precious resource because RISE Tsinghua University’s students told us that only 0.3 percent of the water on the Earth is safe for drinking. We can conserve water by not polluting waterways. For example, people keep throwing rubbish in lakes or rivers. We should stop polluting EVERYTHING! We can conserve other finite resources also by not polluting them, and also reusing, reducing and recycling them. Please save the finite resources! Thank you for inviting me to experience your water filtration experiments. It is hard to believe that people in the world do not have fresh drinking water. Maybe one of you will work for an NGO someday that helps to bring fresh water to rural areas. Who knows what the future holds!? It was great seeing you work hard with the RISE Tsinghua University students to make filters and learn about water conversation. What a smart article Geon Woo. Well Done!! I sure did appreciate Kazuki and Diana’s comments on water conservation. And I love how Joshua is going to take action in his own home to conserve finite resources and reduce emissions. Science sure is a lot of fun when you get to do cool stuff like make water filtration systems. Wow! Science Rules! I am Alejandra from RISE Tsinghua! I am so happy to read your thoughts about our workshop. I hope you can use all these new ideas and one day be future leaders to help make the world a better place. Keep on thinking about these issues and spread your ideas. very proud of you!